A combination of ayurvedic herbs used for the treatment of gingivitis, bleeding gums, painful gums, and teeth. 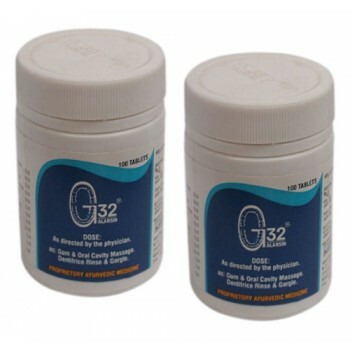 G32 is an overall gum & oral cavity massage, dentifrice, rinse and gargle formula. It has been described as having antiseptic, anti­ inflammatory, astringent, styptic, anodyne, deo­dorant, aromatic, cooling and healing properties. Alarsin G32 is found to be an effective and a safe drug in gingivitis that gives relief from acute or chronic gingivitis in 8 to 30 days. Pregnancy Gingivitis is a fairly common ailment affecting many women. 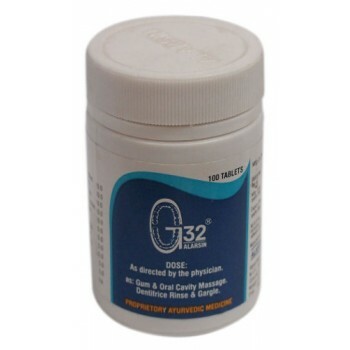 Clinically tests have shown Alarsin G32 Tablets is a safe an non-toxic medicine without side-effect that can give complete relief of gingivitis in 10 weeks to pregnant women. Helps healing process by Keratinization and Granulation. Oral Trauma: Pre and Post wearing appliances, Denture sores, Fixed Frame abrasions, Broken teeth ulcerations etc. Crush 1 to 3 tablets G32 to a fine powder. Massage this powder over gums, teeth and on the affected parts and inside the whole mouth properly, with the help of fingertip. Keep it for minimum five minutes for effective action. Then rinse with fresh water. Repeat two or three times a day as necessary. To maintain good Oral - Hygiene in health and sickness - Use G32 regularly as above, morning and at bedtime. Natural products have a holistic effect on the body, treating not just the symptoms but the body as a whole, and may take time for absorption and results. You should allow several weeks to experience their long-lasting benefits. This product has a shelf life of 3 years from the date of manufacture. Himalaya Herbals - Styplon 30 Tablets If you have bleeding gums, bleeding hemorrhoids, epistaxi..